How will IoT drive the connected economy? Here’s five predictions for 2019 and beyond. Everyone knows connectivity and digitalization are rapidly transforming the global economy – but where will biggest impact be felt? 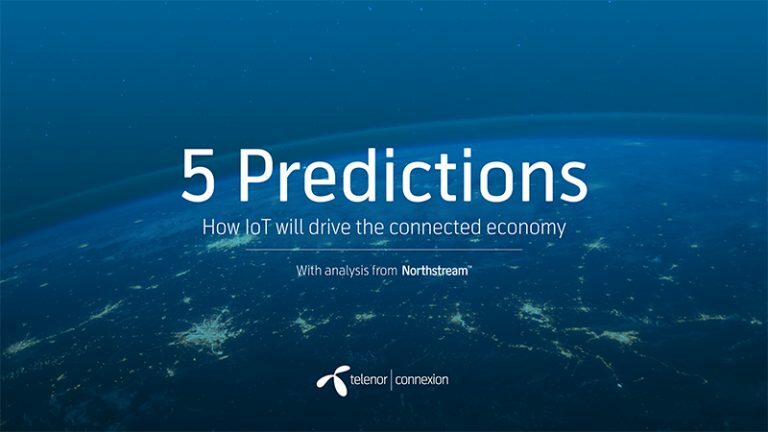 To help you find your way in an evolving business landscape, Telenor Connexion has worked with analysts from Stockholm-based consulting firm Northstream to identify five major trends related to IoT and digital transformation. Below is a quick summary of our predictions. To get the complete analysis from Northstream, be sure to download the full report. The abundance of data coming from connected “things” in the IoT has opened up new markets in which data is bought and sold in many forms. While it has been predicted that collected consumer data will be a valuable asset for many companies, there are still many privacy issues hindering the trade personal data. In contrast, enterprises which deploy connected devices and products have an advantage when it comes to turning data into revenue. Aggregated, non-personal data coming from “things” in the IoT will be the “hotbed” of the emerging data trading industry. Innovative collaborations between businesses will uncover the hidden value of IoT data. IoT newcomers will “leap” over the complexity that first movers experienced and develop IoT solutions in a shorter amount of time and at a much lower cost than previously possible. Early IoT adopters had to do the groundwork of integrating disparate systems and standards. The development of web services will allow IoT newcomers to quickly deploy the infrastructure needed for digital applications, with considerably less effort, time and resources than their predecessors. IoT newcomers will “leapfrog” the early complexity of digitalisation faced by first movers. Today, connectivity is a crucial part of product performance, and thus, the technical aspects and impact cost of connectivity must be considered at an early point in the product development cycle. However, connectivity is still too often an afterthought. To enable new digital products and experiences, considerations related to connectivity technology, technical competence and commercial models will be important to consider at the very beginning of the product development process. Connectivity must be considered from the beginning of the product development process. In an increasingly competitive eCommerce market, mobile connectivity creates a link to the logistics industry which is allowing innovative online retailers to differentiate and stay ahead of the game. By inter-linking the logistics ecosystem, connectivity also facilitates real-time parcel tracking and fulfilment centre optimization. Increased integration of connectivity and logistics, combined with other technologies such as AI, will continue to bring highly advanced products and services to the logistics field. Connectivity technologies will be one of the main forces driving eCommerce forward. As connectivity becomes an increasingly important aspect of a product or service, higher requirements will be placed on connectivity technologies. Connected services must be highly reliable, and troubleshooting or security issues can no longer be left to the end-user to handle on their own. Reliable, managed connectivity solutions will thus become crucial to all types of businesses, requiring businesses to partner with connectivity service providers who can guarantee technical support and quality of service, including coverage, security, latency and reliability. Managed connectivity will be critical to success with connected products. How will IoT drive the connected economy? Full report with five predictions for 2019 and beyond, including analysis from consulting firm Northstream.